Collaborations between film suppliers and machine builders are delivering form/fill/seal systems that produce food containers with improved seal integrity and other benefits. Faster, better, cheaper is the packaging machine mantra, and advances in form/fill/seal equipment reflect those objectives. To satisfy them, machine builders are making improvements to meet the needs of particular food manufacturing segments. Economics drive form/fill/seal: forming a bag or pouch on the fly from rollstock is more cost-effective than filling preformed packages. The format's downside is slower speed compared to rotary fillers, making it tough to compete in the single-serve arena. The wild card for form/fill/seal is seal integrity, and improvements in that area require advances in both machine and film performance. Foodservice is one of the sweet spots for form/fill/seal. Sealed Air's Cryovac division is taking aim at the No. 10 can with films engineered for Onpack 3002, a vertical form/fill/seal unit with advanced sealing technology from Orihiro Co. Ltd., its machine partner. "To capture all of the machine's upside, we had to push the sealing materials to new performance standards," explains John Gaston, director-marketing for fluid packaging-North America at Duncan, S.C.-based Cryovac. "We have parity around certain products now in fill speed" compared to can seamers, and improved product quality and supply chain efficiencies are where the packaging delivers clear advantages, adds Gaston. "I don't see the No. 10 going away; they are sold all over the world, and their sales continue to grow," observes Gaston. "But in certain applications, our goal is to replace them." Those applications include new lines that produce higher-end products. Onpack 3002 uses a constant heat-sealing mechanism that delivers a high-integrity seal with a lower amount of sealing resin. The shelf life of two-plus years for liquids and pumpable foods with good color retention goes well beyond foodservice requirements and should help the business-to-business segment "manage inventories better," he says. Cryovac's long-time collaboration with Orihiro Co. Ltd. is reflected in pouches formed by the Onpack 3002, a new vertical form/fill/seal system intended to replace the No. 10 can. The machine also features the first application of the supplier's Packformance Insight, a software program that addresses the food industry's track and trace needs for real-time data capture and communication. "We call it a smart machine," says Gaston, "a machine with the capability to read RFID tags, capture traceability data, and shoot it anywhere for viewing on a smart phone. It takes the human element out of capturing data." Flexible packages formed at the filler have owned some food categories for decades. One example is bacon. And although horizontal form/fill/seal of pork bellies is nothing new, a sea change is occurring in the category. Curwood is the dominant film supplier, a position it established with a simple strategy: Buy your packaging materials from us, and we'll throw in the machine for free. 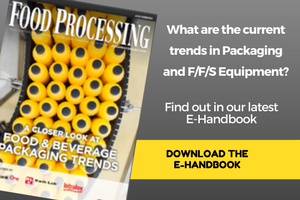 That strategy no longer is in play, and the older vacuum packaging machines it provided are gradually fading away, presenting an opportunity for other equipment suppliers. Robert Reiser & Co., Canton, Mass., seized on the opportunity to engineer a new high-speed machine for retail bacon. Built on a stock sanitary frame from Reiser's German partner Repak, the system has been modified to meet the high throughput requirements of the American market and to meet the product flows and space constraints that U.S. processors face, according to Mike McCann, the packaging specialist overseeing Reiser's system. The goal was to design a machine with simplified mechanical motion and package enhancements to extend shelf life and lower packaging costs, while also enabling processors to upgrade the appearance of their products, says McCann. The new system also allows the use of E-Z peel film. At most of the 160-odd U.S. retail-bacon lines running, sliced bacon arrives single file at the form/fill/seal machine, he says. Rather than complicate the machine and add cost, Reiser stuck with that presentation format while speeding up the sealing process and adding "a revolutionary bottom registration system" for the film, says McCann. The precision of the registration system allows manufacturers to preprint graphics on the film and eliminate the carrier board that typically is used. Other registration systems are available, he concedes, but they require slower operating speed. "The new slicers produce 60 1-lb. units a minute, and we can more than handle that," he says. Advanced controls from Omron keep everything in sync. Electric drives with inverters are used instead of servos to hold down cost. "An AC motor is easy to troubleshoot," says McCann. "With a servo, the solution usually is to replace the motor." Remote diagnostics are enabled through Skype and simple components are "readily available at Best Buy," he adds, preempting the need for more complicated alternatives, such as helmet-mounted cameras and PCs carried in a backpack. The sealing system, which McCann describes as "a cross between vacuum and skin pack," may be the bacon system's most important advancement. The machine trims the film to the flange-seal area, resulting in a cleaner look and no wrinkles, where purge typically migrates and nurtures microbial growth. Shelf life extension on a package that typically enjoys three months refrigerated life is less important than the package-integrity improvement. "A customer told us, 'You don't know what that means to me, being able to sleep at night,'" McCann relates. In a trial involving a pallet load of bacon placed in a HPP unit and subjected to 85,000 psi of pressure, only one of 1,944 packages leaked. Seal integrity is a concern with most containers, a point underscored by March's recall of 2.4 million cans of tuna produced at Bumble Bee Foods' Santa Fe Springs, Calif., facility. If a metal seal can be compromised, the vulnerability of polyethylene or other film material is obvious. Jeff Almond credits film companies for material improvements that are improving seals and driving down processors' costs, particularly in high-speed applications. End seals that used to be in the ¾- to 1-in. range have shrunk to ¼ to ½ in., reports the snack food industry manager for packaging at Heat and Control Inc., Hayward, Calif. On a single bag, the reduction seems insignificant, but reducing the endseal and backseal on an form/fill/seal bag is a major savings for packagers, Almond says. Those cost savings pale in comparison to the promise of ultrasonic sealing, however. That technology exists primarily in prototype mode, although Bosch Packaging Technology unveiled the SPC 4020 vertical filler with ultrasonic sealing technology at 2012's Anuga Foodtech show in Cologne, Germany. "It is more sophisticated, better technology (than heat sealing), but it requires a bigger (capital) investment," according to Martin Dupick, Bosch's global product manager-VFFS product line. SPC is shorthand for SurePouch Clean-fill, a series of four flexible pouch formats, including pillow packs and block-bottom bags. The sealer's vibratory action cuts through any food on the sealing service, resulting in a tighter seal and fewer package rejects. Dupick says the seal surface is only 2.5 mm -- less than 1/10th of an inch -- which reduces film costs. "You can quickly create a business case with an ROI of three months to two years," he says. The downside is lack of industrial hardening: "If you do something wrong with ultrasonic sealing, you can damage the sealer," he allows. "With heat sealing, you can operate pretty brutally." SPC is rated as an ultraclean system, a notch below aseptic. Dairy drinks, noncarbonated beverages, soups and low-viscosity dressings can be filled at a rate of up to 60 bags per minute (bpm). One U.S. client has converted to ultrasonic sealing, Dupick says, "but the majority of the (customer) base isn't ready to make the switch yet." SPC's run rate is sluggish compared to less sensitive products such as potato chips, where gravity is a bigger limitation than machine speed. For lightweight products, the focus has shifted to filling gaps between existing high- and low-end systems, not faster fill rates. Heat and Control's decades-long collaboration with Japan's Ishida Co. Ltd. has helped the companies attain a dominant position in the packaging of dry products, particularly snack foods. The precision of Ishida's scales to drop product into an form/fill/seal machine with little giveaway made it a standard. Heat and Control's expertise in processing and product handling enabled the firm to design turnkey systems that deliver product to those scales and then to the bagger and beyond. Intermittent motion sealers with a nominal rating of 100 bpm dominated vertical form/fill/seal until the mid-1990s, when adjustments to scale height enabled continuous motion sealers, such as Ishida's Atlas 223 bagmaker. The machine's twin rotary jaws are rated at 200 bpm. A huge gap existed between the 223 and Ishida's base unit until the recent introduction of the Atlas 233, a continuous motion single-jaw sealer designed for potato chips and similar products. The 233 operates in the 80-120 bpm range. "If you're not doing automated pack off, it doesn't do you any good to have a machine (like the 223) that produces 150 bpm," Almond points out. Just as the throughput capacity of fryers and roasters dictates how quickly form/fill/seal machines should operate, secondary packaging should be able to keep pace with bagformers. That's not always the case, however, as Wornick Foods discovered when attempting to dry gusseted foil pouches for military MREs (meals ready to eat). Condensation from the retort simply couldn't be thoroughly evaporated from the nooks and crannies of the pouches' folds, resulting in water stains and eventual weakening of the cardboard boxes used for shipping, according to Scott Lynn, eastern regional sales manager for JetAir Technologies LLC, Ventura, Calif.
Physics pointed to the solution. Instead of conveying the pouches through drying tunnels fitted with air knives, JetAir engineered an 8-ft.-long compartment with air nozzles. "Because the nozzles project air better than a knife, they do a good job of penetrating into the gusseted areas," says Lynn. VFDs on the 20 hp high-speed centrifugal blowers improve energy efficiency compared to the 15-ft.-long tunnels that the system replaced. More significantly, the system dries 200 pouches per minute, double the tunnels' throughput. Since the first installation in 2009, Wornick has commissioned four more units. Bottlenecks can occur anywhere on a packaging line, and improvements in one area tend to shift the chokepoints to another. It may look like a game of whack-a-mole, but it's all in the interest of faster, better, cheaper. This article originally appeared in our June issue of Food Processing magazine.